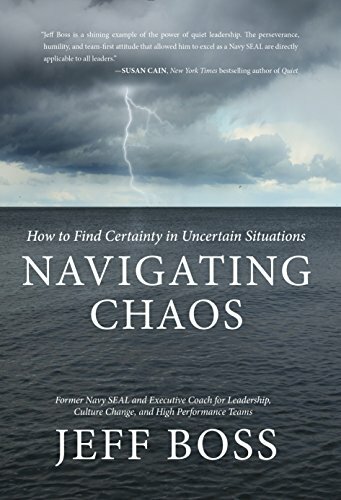 Navigating Chaos: How to Find Certainty in Uncertain Situations is a fantastic book on how to thrive in chaos and uncertainty. Very well written and researched and most importantly backed by experience. Jeff Boss has faced and overcome uncertainty in the most tumultuous circumstances. As a Navy SEAL, he worked in some of the most unforgiving environments on earth and faced enemies that constantly changed, much like today's business landscape. In a world of chaos, how do individuals and teams stay together to find certainty in a world where there is anything but? This book reveals how. Using anecdotal experiences from both the military and business worlds, Boss highlights the mindset and practical steps of how people and organizations can forge certainty amidst inevitable chaos. The book teaches you how to deal with chaos via individual discipline and developing organizational culture and climate that develops mutual trust through building relationships that share information up down and across all channels which leads to the left hand knowing what the right hand is doing. "It’s no secret that to wield optimal performance from an employee, he or she needs a balance of formal education and practical job-related experience, but also personal fulfillment, meaningful relationships, and opportunities to contribute and grow." ~Navigating Chaos: How to Find Certainty in Uncertain Situations (Kindle Locations 126-128). Rare Bird Books. Kindle Edition. This leads to building adaptability at the lowest level, those closest to the action. Using tools such as after action reviews and simply getting people out of their solos so information is shared collaboratively allows organizations to build that team spirit that allows them to work together in the complex and rapidly changing world we live in. "What really happens in these situations, however, is the proliferation of chaos. In response to the uncertainty “out there,” the busy worker bees inside the organization work more frantically, thus increasing the chaos “in there.” Then, as a means of reducing the amount of uncertainty, people dig deeper into the weeds, analyzing more and scrutinizing everything in hopes of making the “best” decision. What results is analysis paralysis: seemingly endless meetings that adjourn with no one left in any better a position than the one they were in when they started. Bottom line is I loved the book and I think you will too! A lot of value for police trainers, police leaders and cops working the street.